A police officer claimed a Coleraine father and son, described as principal members of an organised crime gang being probed over a £600,000 cocaine haul, got others to collect the drugs so they wouldn’t “get their hands dirty”. The detective sergeant was speaking during a failed bail application at Coleraine Magistrates Court on Monday by Peter Neill Snr (48), of Hazelbank Road. Police claim Neill and his son, Peter Neill Jnr (30), are linked to the discovery of £405,000 worth of cocaine found in a car near Lisburn and another £195,000 of the drug which was brought by train into Belfast. Neill Jnr recently received bail but his father is currently on remand in Maghaberry jail and police opposed his bail application. A detective sergeant said at 9pm on November 20, 2015, as part of a surveillance operation a silver Mercedes car was stopped in the Dundrod area and one kilo of cocaine with a street value of £405,000 was recovered. 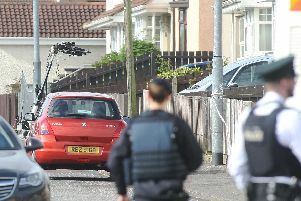 The officer said the driver, who is now regarded by police as ‘an assisting offender’, told them he was contacted the previous day by Neill Snr who said to meet to him at Coleraine ‘Trim Trail’ where he was met by the two Neills who provided him with details for “drugs runs”. The court heard the drugs were to be taken to Coleraine to be cut and then to “the big man in Strathfoyle” in Londonderry. The officer said the assisting offender, who is due in court in Lisburn next week, claimed to have been a “drugs courier” on 40 occasions between 2012 and 2015 for the Neills. The detective told the court the assisting offender had identified individuals he met in Claudy and Derry in a police identification line-up. The officer said in February last year a man got off a train from Dublin in Belfast and was found with £190,000 worth of cocaine enroute to Coleraine which was to be mixed with other products. The officer said they had audio recordings of calls made by another man to a number used by Peter Neill Snr. The police man said police seized cars belonging to the Neills last year including Neill Snr’s Audi A5 and swabs showed traces of cocaine. He alleged that on an iPod taken from Neill Jnr there was a phone number of the ‘assisting offender’. The court heard dozens of phone sim cards were also seized along with a deactivated assault rifle. The officer said they had a large number of audio recordings and they believed Neill Snr was involved in the supply of drugs. Peter Neill Snr faces eleven charges including three of conspiring to supply cocaine. He is also facing three charges of being concerned in the supply of the Class A drug. He is further charged with being concerned in the supply of cannabis and conspiring with others to supply the Class B drug. Neill Snr is also charged with possessing and transferring criminal property and having ‘a firearm other than a handgun, namely a magazine suitable for an assault rifle, without holding, a firearm certificate’. When arrested he denied all the allegations but the officer said he believed there is a likelihood of reoffending as he had a relevant conviction in 2013 relating to the importation of £50,000 worth of drugs from China when he was jailed for 20 months. The officer said he believed the Neills were “principle members of this organised crime gang” and added: “They are not going to collect the drugs, they are not going to get their hands dirty”. A defence lawyer said other people who were arrested have been granted bail. Refusing bail and adjourning the case until February 20, District Judge Peter King said the difference between the two Neills was that Neill Snr had 180 previous convictions.